A true classic and an undeniable icon, a great cappuccino is high on the list for coffee enthusiasts. The deep taste of espresso, combined with velvety foam and textured milk, make this drink a great pleasure time and time again, whatever the occasion. The balance of dark roasted coffee, milk, and touch of sugar means there’s nothing you need to add to this great little coffee capsule. Less milky than a latte and more easy-going than an espresso, the smooth texture of a cappuccino is something you simply can’t forget once you’ve tried it. And now you don’t need a barista in your kitchen to enjoy it every day, as thanks to the maximum 15-bar pump pressure in your NESCAFÉ® Dolce Gusto® machine that coffee shop taste is always within reach. The ideal cappuccino is sophisticated but laid-back, easy to drink, and just the right temperature to sustain its unforgettable flavours. This makes it a staple of any enthusiast’s NESCAFÉ® Dolce Gusto® pod collection, popular with friends and family and absolutely ideal for kicking back and relaxing when you need a break. If you love it when your coffee looks the part take a look at our striking Funky Cappuccino Cups, specially designed to make most of the your Cappuccino pod coffee. Whole Milk Powder, Sugar (17%), Emulsifier (Soya Lecithin). Such a beautiful blend of coffee & milk. Love love love! Enjoyed the drink immensely and loved how easy it was to make. I'm looking forward to having many more. Beautiful Coffee thats given me my independence back! I treated myself to the Dolce Gusto Lumia by Krups for Christmas and haven't been disappointed! Being very disabled and bed bound, being able to have the machine and coffee of choice (Cappuccinos and Lattes by my bed side is a complete Godsend and takes pressure from my husband, who is my carer, in having to make my drinks. (not that he minds but its one less thing he has to do for me) I've not had one coffee that I've not enjoyed and being able to help myself to the first coffee of the day is a dream come true. 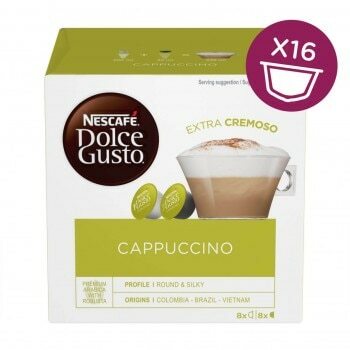 I'd recommend anyone buy themselves a Dolce Gusto. Its given me not only independance but fantastic tasting coffee which is so easily made. One of my favourites. A lovely drink and perfect for a morning of relaxation. Nice blend of milk and coffee and add a sprinkle of chocolate on top to finish it off nicely. A lovely velvety classic and a morning must. Bought on recommendation as I like cappuccinos and lattes. However compared to the ones I usually buy the coffee is very weak and there is a very high sugar content . I see that my comments are similar to those already posted. Could you make a sugar free version please?